After witnessing an electrician fall off a ladder, Abhijeet Purkayastha was inspired to create new safety devices that can hold a ladder steady -- and make your home improvement projects less dangerous. 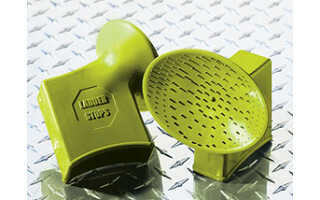 Grippster Ladder Stops are round safety cups that attach to the top of an extension ladder to minimize slipping and skidding on flat surfaces. In addition to keeping your ladder in place, they’ll help prevent surface dents and scratches. For those projects that require strapping down, tying up or otherwise immobilizing something, check out Abhijeet’s BYOB “build your own bungee” cord. This stretchy, super-strong bungee cord can be cut to whatever length you need, so you can achieve just the right tension when you’re securing a ladder (or anything else) for transit or storage. Spring is in the air, and with it comes a new round of outdoor projects. 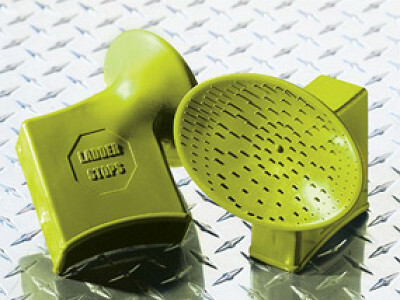 Arm yourself with Grippster’s safety devices. They’ll keep you and your gear in just the right place. 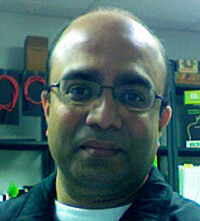 Hi, I'm Abhijeet. My eureka! Moment came when I saw a repairman fall from a ladder. It slid from the surface it was resting against, and I realized I could come up with something to make ladders safer. I'm here to introduce the LADDER STOPS, which fit easily over the top rails of an extension ladder. The STOPS stabilize the ladder and prevent marring and scuffing of walls and surfaces. My second product is BYOB - Build Your Own Bungee. This super-strong polyurethane cord has thousands of uses, can be cut to your desired length, and is adjustable for perfect tension. It's safer and much longer lasting than other bungees. The BYOB is so rugged it's used by the U.S. and Canadian Military. So please feel free to ask any questions, I love to talk about my products! I always cringe and hold my breath when I use our ladder against our siding but it never occurred to me that there is a safer way to do it. I also love the adjustable bungee cord. Two very smart products. Randy sent me the URL for Daily Grommet, and the first thing I clicked was this product, and I saw your post, so why didn't we think of this years ago! @Scott Feher: Scott,old neighbor! So truth be told, it's a neighbor's ladder because that's what neighbors are for. I am getting these for them for all the times they have graciously let us borrow it. And he is often the one on the ladder. I am the one looking on with a camera in one hand and a phone in the other ready to call 911. Shoveling snow off roofs, with a 15' roof shovel, precariously navigating between electrical wires, with one end of the ladder in a snowbank and the other end skittering along our siding...it's been quite a winter. Brilliant! There must be a million applications for both of these products. After witnessing an electrician fall off a ladder, Abhijeet Purkayastha was inspired to create new safety devices that can hold a ladder steady -- and make your home improvement projects less dangerous. Grippster Ladder Stops are round safety cups that attach to the top of an extension ladder to minimize slipping and skidding on flat surfaces. In addition to keeping your ladder in place, they’ll help prevent surface dents and scratches. For those projects that require strapping down, tying up or otherwise immobilizing something, check out Abhijeet’s BYOB “build your own bungee” cord. This stretchy, super-strong bungee cord can be cut to whatever length you need, so you can achieve just the right tension when you’re securing a ladder (or anything else) for transit or storage.